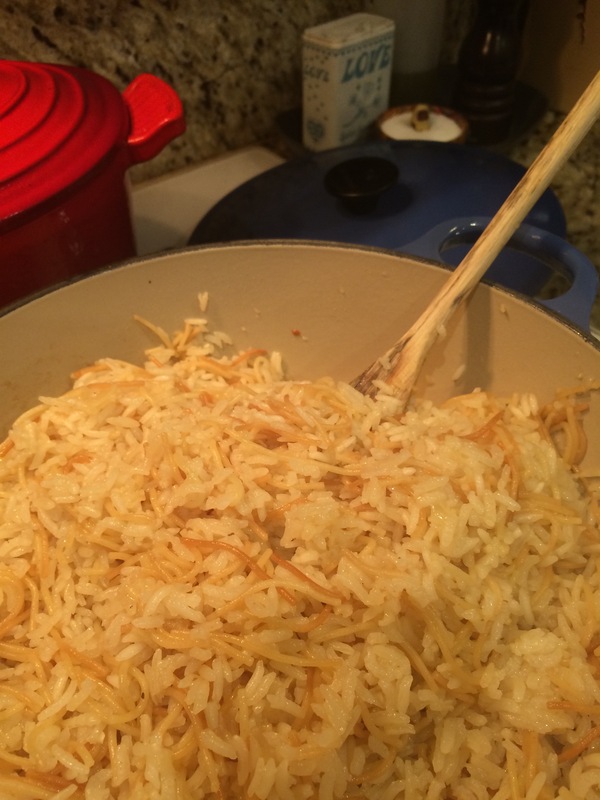 America’s Test Kitchen Rice and Pasta Pilaf -or- Home Made Rice-A-Roni! I grew up eating a healthy mix of home cooking and pre-made junk. Dinner could be Packet of Spaghetti Seasonings + ground beef = Spaghetti Sauce… or maybe fried chicken from scratch. Casserole with Cream O’ Something Soup was just as likely to be on the table as a completely homemade soup- homemade right down to the broth… yum! My mom, grandmother, and later, mom-in-law all had great dishes to pass on. I love to cook and feel indebted to them for sharing. 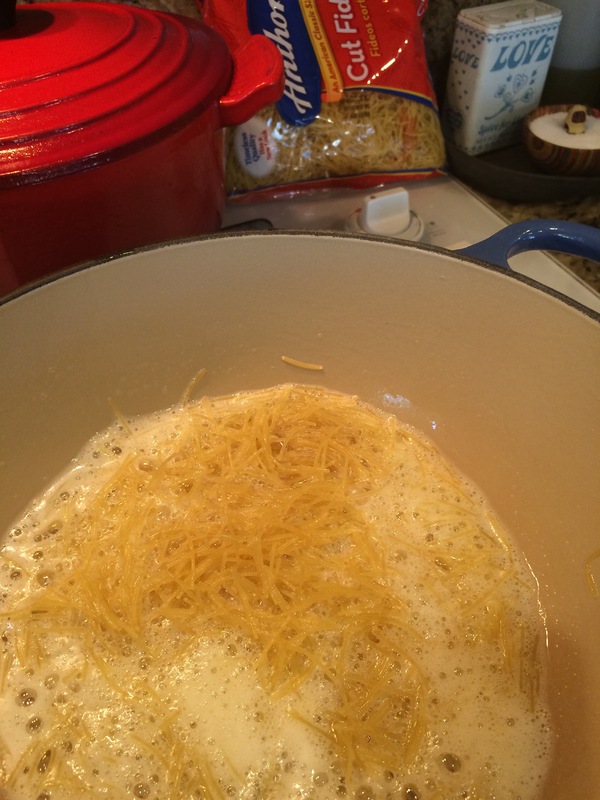 2- In a heavy pot, brown the pasta in the butter over medium heat for about three minutes. Watch out- it will turn from light to browned very quickly… in about as much time it takes to snap a picture of it for you blog, for instance, it can go from blond to over browned. Yep. 3- Add grated onion, salt, and garlic. Sauté for 3-4 minutes until clear. Add rice, sauté until clear, another 3-4 minutes. If you thought the pasta smelled great while it browned in the butter, this will smell even better. 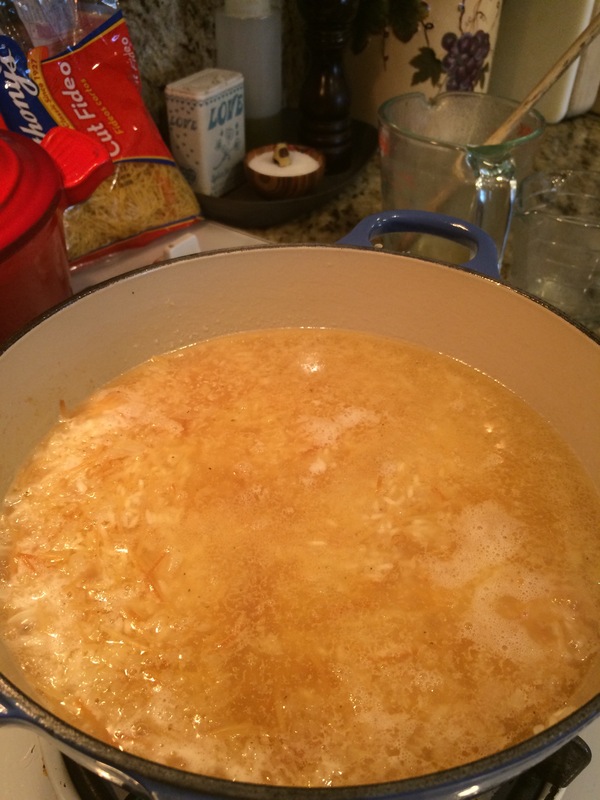 4- Add chicken broth, bring to a boil, turn to low and cover for 10 minutes or until all liquid is absorbed. Mine took more like 20 minutes (water wasn’t hot enough to par cook the rice in step one, I think). 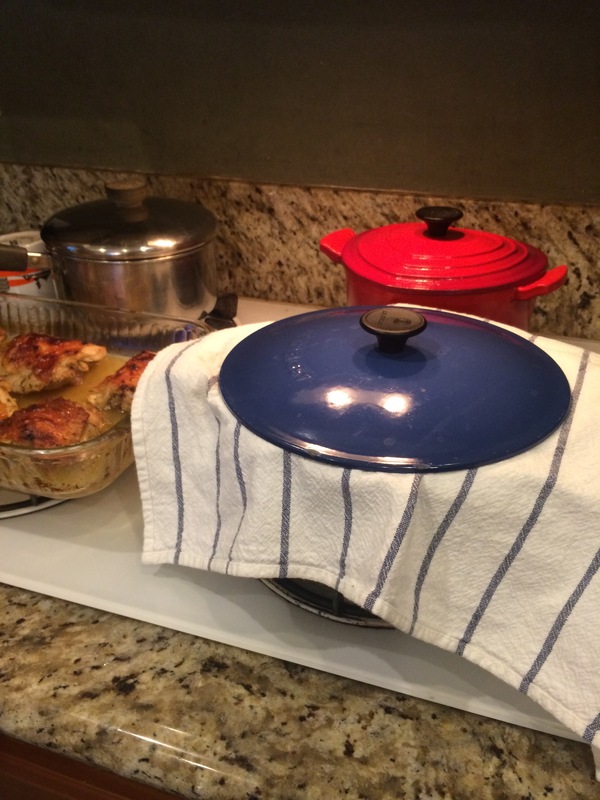 5- Let your pilaf finish by resting with a towel between the lid and the pot. Fluff up and serve! I’ve never done this extra step before, with the towel, but I really think it did help keep the pilaf fluffy. So, how easy was this? About as easy as the original boxed recipe, really. Except for grating the onion… I’ve never grated onion before, and some of my knuckle got into the dish, I think. Ouch. Overall though, it was a pretty tasty side dish! And most importantly, better than the boxed mix. Wow, those additions sound delicious! I bet that pine nuts would be nice with raisins and apricots, I think I’ll try that tonight. Glad you liked this post! What kind of vermicelli did you use? I am having trouble finding the same kind they used on the show. Hope this helps! 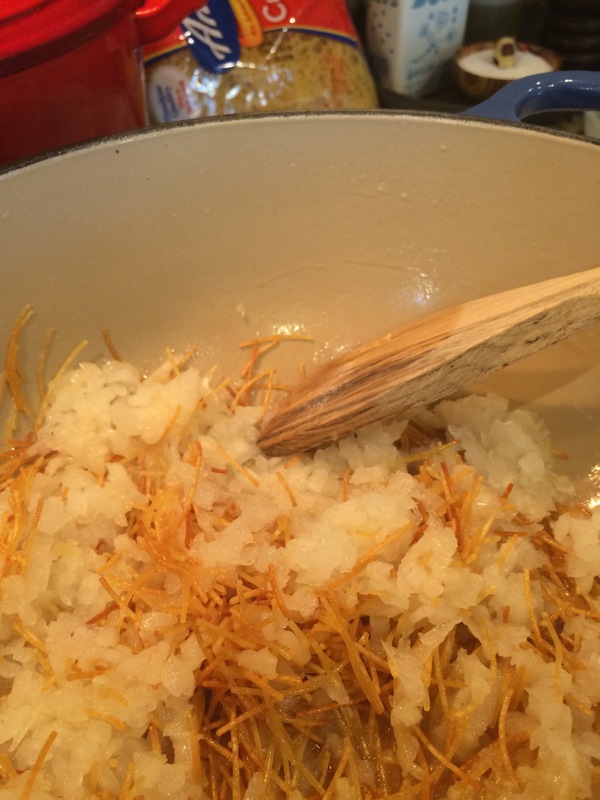 I have made this recipe several times now and really like it. If you have the time and if cooking is your bag, NOTHING beats making an old standby like this with your own simple ingredients! I, too, could not find vermicelli. I opted for Barilla Fideo (cut spaghetti). THANK YOU to the original poster of the recipe because ATK did NOT mention the quantity of rice. 🙂 This was my first visit to this site and I will be back. Glad you were able to find what you needed here! I’m going to start the blog up again soon, I had so much fun writing about and sharing something new and different every day in 2015 that I want to do it all over again in 2017! Your recipe says 1/2 cups of rice. Do you mean 1 1/2 cups? Wow, I’m glad you asked this question! It seems that when I changed the look of the blog that now some of the text has become covered up by photos- oh no! If you are viewing this post on a mobile device, the “1” of the “1 1/2” cups is obscured. Bummer. I am super-grateful that you were able to bring this to my attention! Question, we always added frozen veggies and cooked meat to Rice a Roni as a kid. What do you think about that? Would you brown the meat and veggies for final ten minute cook time? I also wonder if browning the vermicelli in the fat from the cooked meat would add flavor. Thoughts? I just read that you added chicken and pineapple. So, when did you add them and would you use rendered fat? Also, how much parsley (fresh or dried?) Was in original recipe?